The aim of Friends & Patrons of the Stavros Niarchos Foundation Cultural Center (F&P of the SNFCC) is the promotion and support of the Stavros Niarchos Foundation Cultural Center (SNFCC) through a network of friends, patrons, donors, sponsors and volunteers. To create an institution with international and Greek focus, whose aim is to help SNFCC to be established as one of the leading Cultural Centers in the world. To support SNFCC to become an International Center of Competence for interrelated and interdisciplinary activities in the fields of arts & culture, education and environment. To attract Greek and international visitors, users and students, especially the younger generation, to “acquire ownership” of SNFCC, thus fulfilling the goal of the donation. Educational programs: scholarships, seminars, master classes and internships for highly gifted students and professionals all over the country in the fields of arts and music, education and environment. Exchange of best practices and transfer of know-how: by supporting common projects between the three distinctive activities of SNFCC -the National Greek Opera, the National Library of Greece and the Stavros Niarchos Park- in collaboration with leading international institutions. Organizing social, educational, recreational activities and events to enhance and promote SNFCC. Initiating a series of programs-activities (mySNFCC) arising, designed and developed from the open invitation of F&P of the SNFCC to the general public -or alternatively to specific interest groups- to provide their personal perception of the SNFCC and how they want to experience it. 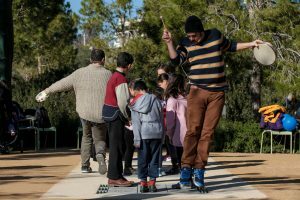 Through these activities, the aim is to provide the mean to every visitor to “transform” the SNFCC to a unique personal experience!